The main objective of the round table meeting was to establish a consensus among the key actors on the future of inland navigation in Sweden. 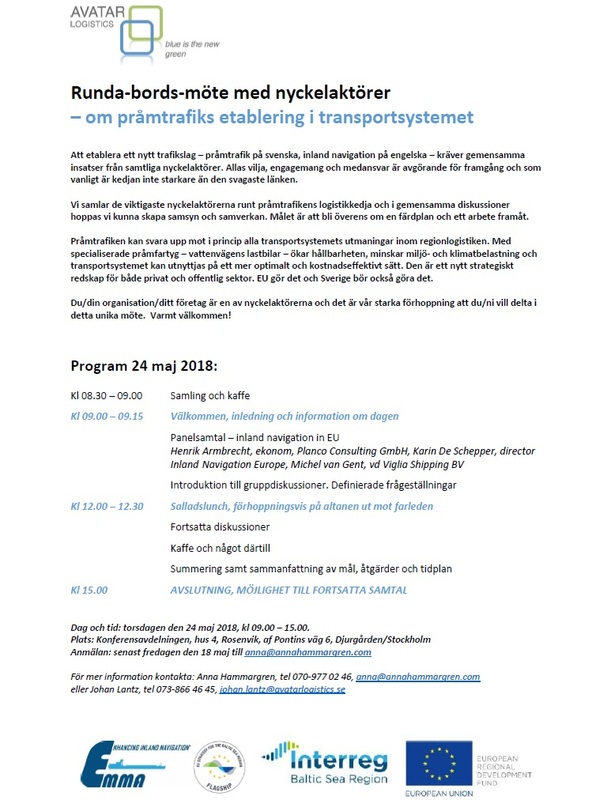 The round table meeting, arranged by Avatar Logistics within the framework of the project EMMA, took place on the 24th of May in Stockholm. In the meeting it was underlined that aiming at success of inland navigation in Sweden must be a joint responsibility of all parties. Sweden implemented the EU regulations for inland navigation in 2014 and as an introduction, Johan Lantz from Avatar Logistics gave a presentation of the present IWT situation in Sweden. According to Lantz, the development has been very slow and the IWT market has not developed at all during the last three years. However, Sweden needs to find ways to boost inland navigation if the government’s goals of a modal shift from road to inland navigation will happen. In his speech, Lantz stressed that it is a joint responsibility of all key actors that inland navigation in Sweden will succeed. Most importantly, inland navigation must be officially appointed as the 5th mode of transportation in Sweden in order to reach a same kind of playing field for the whole transport market. The expert panel of the round table meeting consisted of Karin de Schepper, Director at Inland Navigation Europe, Michel van Gent, CEO of Vigilia Shipping Ltd. and Henrik Armbrecht, Consultant at PLANCO Consulting. In their own expert fields, the panel members gave recommendations on how Sweden can move the inland navigation process forward. In addition to presentations, the audience was able ask questions from the experts. One of the targets of the meeting was to establish a mutual plan of how to move forward. Thus, several group discussions were executed. The outcome of the meeting was an action list with different activities that hopefully will help the Swedish inland navigation forward. In total, 22 persons participated in the round table meeting, representing key actors in Sweden. The organizations represented were: Ministry of Enterprise & Innovation, Swedish Transport Administration, Swedish Maritime Administration, Swedish Transport Agency, Avatar Logistics AB, PREEM Sweden AB, Jehander/HeidelBerg Cement, City of Stockholm, FullPage Communication, Port of Stockholm, Port of Gothenburg, Port of Södertälje, Erik Thun AB, Swedish National Road and Transport Research Institute and Swedish Royal Institute of Technology. Avatar Logistics will organize a new meeting in October with a target to follow up the activities in the action plan.